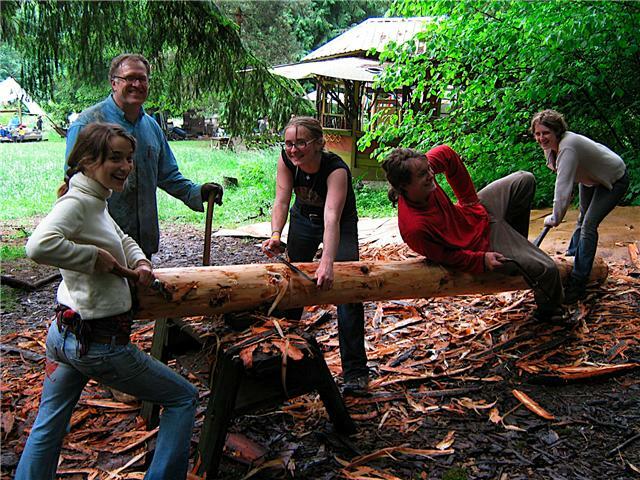 Summer Sustainable Communities Immersion Program at TLC Farm - dive into sustainable living! Located at TLC Farm's unique seven-acre community farm in Portland, Oregon, this internship program will inspire dynamic leaders in the sustainability movement who will be able to use their new skills and knowledge to benefit their home communities. TLC Farm's immersion program consists of a three-week summer session which will immerse ten interns, 18 and older, in a hands-on, holistic approach to sustainable living and community. Three-week Community Sustainability Internship will introduce participants to the principles of permaculture, natural building, community process and organic gardenong, with a focus on local food and plant medicine. Interns will tend, harvest and preserve food from the animals and garden, learn to make medicine from wild and cultivated plants, and visit urban & rural sustainable farms. Tuition, room & board: $1,600. ($1,500 if signed up by June 15). The internship program will combine theory, practice, innovation and adventure. From learning how to grow and preserve food, to how to make decisions in community, to integrating social and environmental justice, each intern will come away from this program with a set of skills which will be increasingly useful in our changing climate and economy. Courses will be taught by TLC Farm teachers and local expert. Each intern session will culminate in a personalized action plan, supported by intern mentors. A limited number of work-trade scholarships are available. Please contact intern@tryonfarm.org or call 503-245-3847 for more information about the program and registration. Application instructions are available at http://tryonfarm.org/share/node/687. Moon, the intentional community at TLC Farm. summers are often quite dry especially from July through September. and dairy goats for eggs and milk and grow much of our own food. Most of the work-trade positions have been filled for our 2009 program. However, there are still some available. Please inquire with Laura or Matt at intern@tryonfarm.org to find out what positions are left, and specifics on fee reduction, etc. There are four work-study positions provided for each intern session. Keywords: permaculture, sustainability, sustainable, garden, food, plant spirit medicine, summer internship, summer internship, camping, Oregon, PNW, NW, Portland, farm, forest.